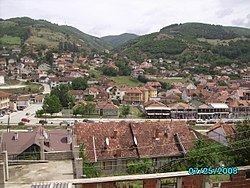 Kaçanik or Kačanik (Albanian: Kaçanik or Kaçaniku; Serbian: Качаник, Kačanik, [kâtʃaniːk]) is a town and municipality in southern Kosovo, in the Ferizaj district. The municipality covers an area of 220 km2 (85 sq mi), including the town of Kaçanik and 31 villages. It has a population of approximately 33,454. With the exception of eight Roma and 30 Bosniaks, the municipality is ethnically homogeneous Albanian. In March 2011 the pilot municipal unit of Elez Han was established within the Kaçanik municipality, holding approximately 10,000 out of the 33,454 total inhabitants. The region of Kaçanik was one of the pathways, which were employed during Central European (akin to the Lusatian culture) migrations in the southern Balkans between 1200 and 1150 BCE. Roman era monuments include an altar that dates to 158–9 CE and is dedicated to a deity named Andinus (Deo Andino). The name Andinus appears among the central Illyrian and Dalmatian names, but the worship of Andinus seems to have been a local cult of southwestern Dardania as it doesn't appear in other parts of the Illyricum or the Roman Empire. In the Middle Ages. Kaçanik was captured by the Ottomans in the 1420s. At that time Kaçanik was only a village registered by the Ottomans in 1455 defter as nahiyah. Kaçanik was founded by Koca Sinan Pasha, who erected a tower, the town mosque which exists even today, a public kitchen for the poor (imaret), a school near the mosque, two hane (inns similar to caravanserais), one Turkish bath (hammam), the town fortress and a few mills on the Lepenac river. Koca Sinan Pasha, an Albanian, called the town Kaçaniku. A Kachak refers to an Albanian outlaw. As the Kaçanik area was used as a hideout for the Kachaks, Koca Sinan Pasha built the town fortress to keep out the Kachaks. Çelebi, who traveled through Kosovo in 1660, wrote that the town's name derived from the Turkish word Kaçanlar in reference to a group of Albanian bandits that operated in Üsküb and used the region of Kaçanik as a hideout. 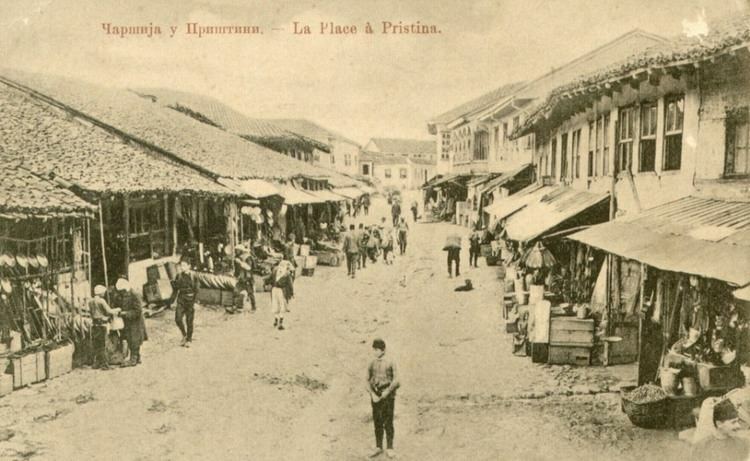 Kaçanik became known administratively as a town by the end of the 16th century, and up to year 1891 it was a part of the Ottoman Sanjak of Üsküb, which again belonged to the Kosovo Vilayet of the Ottoman Empire. In 1878, Kaçanik was intended to become a part of the Principality of Bulgaria according to the Treaty of San Stefano, but per the Treaty of Berlin it was returned to the Ottomans. During the Albanian Revolt of 1910, the area of Kacanik was the battlefield between Ottoman and Albanian forces. After 1912 the town became part of the Kingdom of Serbia, and after 1918 part of Kingdom of Serbs, Croats and Slovenes (the first incarnation of Yugoslavia). From 1929 to 1941 Kaçanik was part of the Vardar Banovina of the Kingdom of Yugoslavia. From 1941 to 1945, the town became a part of Albania under Italy and Albania under Germany. In 1990, after the suspension of Kosovo's autonomy, the members of the Kosovan assembly gathered in the town and adopted the Kaçanik Constitution, based on which the Republic of Kosova was proclaimed in 1991. During the Kosovo War, Yugoslav forces including the army, police and paramilitary groups carried out operations in the town that led to high numbers of civilian casualties and mass flights of civilians from Kaçanik. Considering that through Kaçanik runs the main roadway that connects Pristina and Skopje, as well as the railway Kosovo Polje-Thessaloniki (constructed in 1879) Kaçanik is an important place and a strategic economic focal point. The Kaçanik municipality is mainly known for the production of construction materials at several area companies. But there are many well cultivated farmlands and areas well suited for the development of farms, apiculture, arboriculture as well as various craftsman and artisans. The area is especially well suited for the development of winter and summer tourism. The area boasts some spectacular views and the downtown is home to a bus station, a small radio station, the remains of a Turkish fort, several streets lined with shops, banks, several large modern restaurants, and a weekly farmers market for produce, livestock and housewares. Kaçanik has an old tradition in private manufactures, especially when it comes to the production of calcareous stone, wood for construction purposes and other services and artisan skills.